When healed in a private space, the ailments of the body dissolve. Wellness is restored! ┃ When your body is in good health, don’t you feel refreshed? Using one of Chinese traditional medicine’s three major cures, I use therapy called Tuina massage to stimulate key pressure points in the body. This allows the circulation of life energy to flow through the channels of the body as circulation improves and stiff muscles become relaxed. Whether you are suffering from sore muscles or specific issues, or want to maintain good health of your body, we can match treatment to each person’s needs. I help make the body refreshed and relaxed, preventing illness, treating disorders, and promoting overall wellness with Purehands massage. The human body has 14 pulse points that channel energy throughout the body. By using traditional Chinese medicine practices, we can use key points to increase flow of energy by using acupressure massage. PureHands massage differs from a normal massage, by starting at the top of the head and following the circulatory system, waking the body and improving circulation and awakening the natural healing power that each human being possesses. 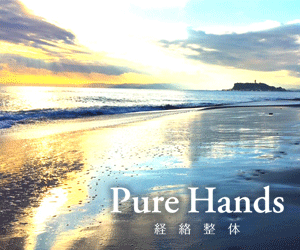 Pure Hands massage is beneficial to children and adults of all ages. This Oriental medicine-based massage cures and refreshes the body using massage, manual therapeutics, and chiropractic elements. Worked at East Zushi Osteopathic Clinic. Studied chinese medicine osteopathic & chinese medicine Qigong at Heilongjiang Chinese Medicine University, Japanese school. Every day, I do my best to utilize my skills in the treatment and healing of my customers. 1-minute walk from the East exit of Mutsuura station. Exit the station and walk straight(about 100meters). 1. Turn right by the blue tent behind Mutsuura station. 2. Go straight 50meters of going straight. 3. Turn left at the park. 4. The parking lot is on the right.